With one day to go in the 2017 Australian Kart Championships presented by Jayco and Castrol EDGE, six of the nine Titles are still up for grabs with mere points separating the protagonists in those classes. 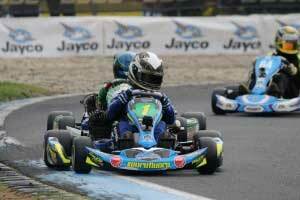 Joshua Fife has wrapped up the Australian KZ2 Championship with a day to go after a fine display. He was awarded the Aaron Ivermee Medal by securing the pole position for the second year in a row and then with his two seconds and heat race win has built an unassailable Championship lead. Team CRG Australia’s Pierce Lehane has been rapid winning two of today’s heats but not finishing the second – this has elevated him above early Championship leader Troy Loeskow – who has had an unhappy day in his Ricciardo Kart, qualifying 18th. Brendan Nelson has successfully defended his Australian TaG 125 Championship although has had to work for it. Consistency has got him through the day. Whilst Nelson qualified ninth, his chief rival, Joshua Rogers qualified 13th. Meantime, Joshua Car – who still had a mathematical chance for the Title has been among the frontrunners. While the Championship battle has been playing out outside the top 10 the battle up front has been a thriller with Kody Garland and Cody Gillis sharing heat race wins, with Car Paul Rodgers and Aaron Hindle in the podium mix as well. Champion elect in Cadet 12, James Wharton had amassed enough points coming into this event to be Champion. His dominance today has continued setting pole position and taking all three heat races, however Marcos Flack has kept pace with the Shamick Racer. So dominant has Wharton been, he has secured 308 of the 338 points on offer in the four and a half rounds of the Championship so far. The Title race in KA3 Senior couldn’t be tighter. Defending Champion, Matthew McLean and four time Australian Champion, James Sera are locked on points heading into tomorrow. The two have staged a thrilling battle throughout the day, McLean’s run hampered by a non-finish in the second heat after a turn one incident. Right up the front throughout the day too has been Benito Montalbano. 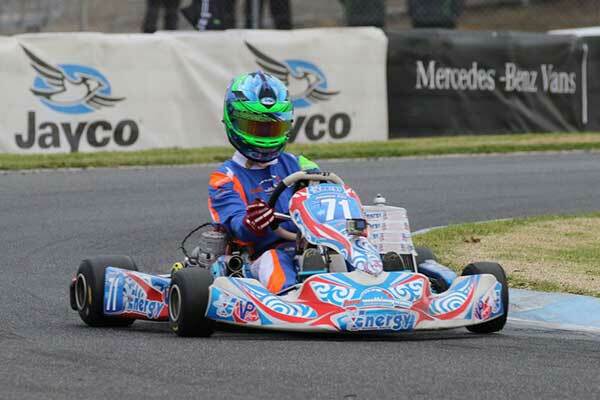 Earlier in the day, Benjamin Mouritz set his first ever Australian Kart Championship pole position. Shamick Racing’s Harry Arnett holds a three point advantage over defending Cadet 9 Champion Ryan Tomsett. With Arnett qualifying down the order, Tomsett was able to open a strong lead, which Arnett closed down heading into the third heat race. The local driver eclipsed the defending National Champion on points in the last race of the day. Tomsett has been embroiled in a battle with Lewis Francis and Toby Dvorak – Dvorak in the mix for third in the Championship. Cadel Ambrose took out the opening heat race which saw the race interrupted by rain with all drivers on slicks. Ambrose, the second round winner, is in the mix for the top three in the Championship aboard his MadCroc Kart. Just seven points separate Jay Hanson and Cooper Webster in KA4 Junior. The duo have been fighting at the front along with Kacey Mann and at times Kai Allen. Hanson had the lead out to 1points however a final heat race win for Webster and Hanson being shuffled down the order saw the defending Australian Champion close within striking distance with a heat race and the Grand Final tomorrow. Velocity Kartsport’s CompKart driver, Joshua Car has maintained his lead in the X30 Championship and holds a five point advantage over Patrizicorse Ricciardo Kart driver, Marc Tulloch. Heat races were shared between polesitter, Matt Beninca, Kiwi Dylan Drysdale and Tulloch. 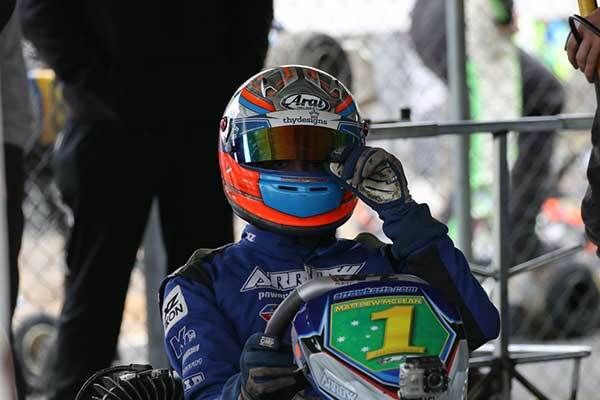 Drysdale has elevated himself to fourth in the Title race behind FA Kart’s Justin Francis. 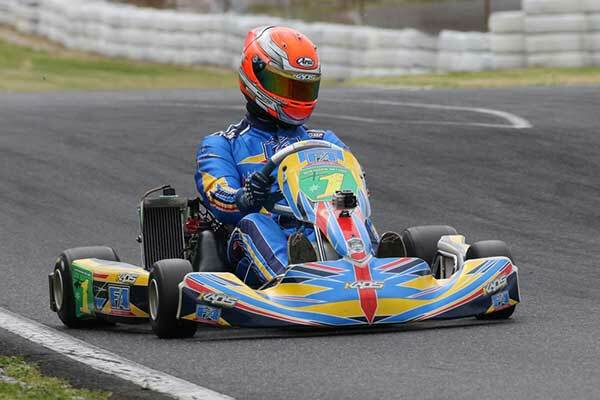 PFG Kosmic driver, Broc Feeney has had the best of the battle for KA2 over chief rival, Lachlan Hughes in his Ricciardo Kart. Feeney established the pole position over Hughes and then went on to resoundingly win the first two heats. Hughes had to fight his way forward after being shuffled down the order and getting the start in heat three and went on to record the win over Feeney. This closed the points gap to 12 between the pair. Last round winner, Christian Pancione had a mixed day in his FA Kart. Being involved in a first lap incident in heat one, he struck back to finish second in heat two and in heat three didn’t finish after going too deep while attempting a move on Feeney at turn one. Whilst overtaking Cody Burcher for third in the Championship, the non-finish in heat three has left the battle for third wide open heading into finals day tomorrow. KA1 is at its most entertaining this weekend. The Championship lead has switched after qualifying and after heat races between Scuderia PCR’s Kyle Henry-Smith and HDR Arrow’s Scott Sorensen. Placing further excitement into the mix, Ricciardo Kart’s Jace Matthews has been throwing caution to the wind in his bid to close the gap and capitalise on any misfortune that may afflict the top two, winning two of the heat races this afternoon. Heading into tomorrow though, Henry-Smith holds a six point advantage over Sorensen with Matthews 36 points behind – still mathematically in with a shot of winning should Henry-Smith and Sorensen both not finish either the heat race or final. Tomorrow’s action begins at 8am at the Port Melbourne Karting facility with the final heats and the Grand Finals of the Australian Kart Championship presented by Jayco and Castrol EDGE for 2017.